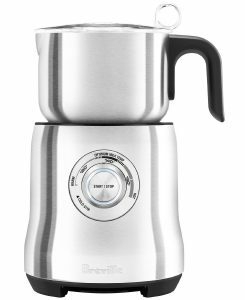 The Breville BMF600XL Milk Cafe Frother is a premium quality milk jug type frother at a premium price on Amazon. But by paying more, you get a machine that gives you precise control of your temperature, and you can produce the type froth you want. And you get a machine that will deliver a range of delightful drinks calling for frothed milk. 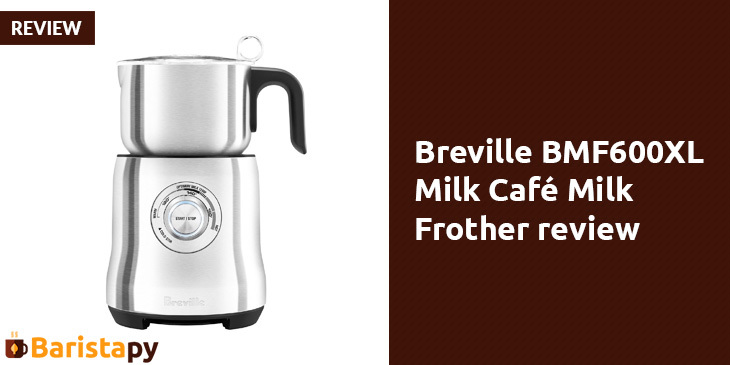 The BMF600XL by Breville both heats and froths milk. So you can make hot chocolate calling for heated milk or cappuccinos or lattes calling for frothed milk. As noted, with the Breville, you can choose the precise temperature. The best temperature range for making milk froth is 140 to 160 degrees. Start high until you know learn by doing. Push the dial, and when the liquid hits the selected degree, its auto shut off function cuts the heat. Fully automatic. Induction coils heat the milk in an even manner. Comes with two different disks for two types of froth. Choose the cappuccino disk for a froth with a creamy consistency. Choose the latte disk for a smoother and more fine consistency. What the disks do is circulate the milk so it won’t burn. The disks rotate via magnet and not by a mechanical means. The benefits are fewer moving parts and a simpler operation. The main drink creations are cappuccinos and lattes. But as mentioned, you can easily produce delicious hot chocolate from powdered cocoa or chocolate syrup. Chai tea is another possible concoction. Plus, you can add hot milk to other teas. Certainly, you can vary the type of milk you froth for a variety of drinks. The Breville works with full fat milk, skim milk, nonfat milk, almond milk, rice milk, and soy milk. Coconut milk is a great choice, too, for a healthy milk and coffee blend. Sweeteners include, agave nectar, stevia, honey, and sugar. And remember, cold drinks come from the Breville’s cold milk froth. Read the recipe book written by Breville for you. Note that the company includes a measuring cup for these ingredients. The LED indicates active frothing. In 1 to 2 minutes, your froth is ready. For a “mountain” of foam, frothing may take up to 4 minutes. You do not have to wait long to drink your specialty coffee. The Breville froths your milk fast. 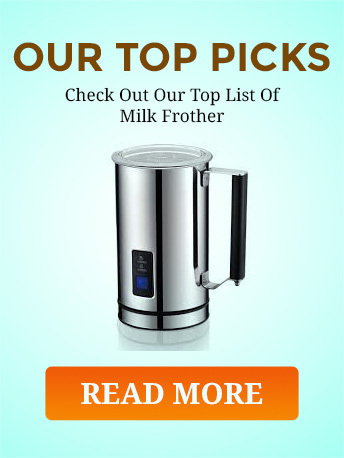 The Breville jug definitely holds more than other brands of milk jug frothers. When making froth for a cappuccino or latte, you can fill the jug full to 16 ounces. When making hot chocolate, pour in even more milk—up to 25 ounces. Note: you must use at least 8 ounces for a batch of froth. The appliance won’t work otherwise. Has efficient design in a unit that is only 6 x 6 x 10.2 inches and weighs just 3.6 lbs. This Breville frother spares you counter space. And after frothing, it is very easy to clean as the pitcher and lid come off and go in the dishwasher. The pitcher is of sturdy stainless steel, and the lid and whisks are built of plastic. This milk frother is manufactured by HWI / Breville USA. The Breville line of small appliances for beverage creation, food preparation, cooking, commercial use, and cookware is an upscale line—an intelligent and innovative brand. The company slogan is “We’re Food Thinkers.” The Breville BMF600XL Milk Cafe Frother carries a 1 year limited warranty to protect you against defects in the product’s material or in its workmanship. You have a safe buy. Q: Is a product guide included? A: Both a manual and a recipe book are included. Q: Why is the price higher than certain competing frothers? A: The design is superior. Has no moving parts. No shaft. The disk spins via magnetic force. With the Breville, you do get what you pay for. Better design. More control. And production of a greater variety of beverages is possible.